As parents, we worry that every single thing we do will impact our kids for the rest of their lives, and with good reason. The lessons that we teach them early on helps to shape every aspect of their future. We want those lessons to be as positive as possible so we can raise happy, healthy children that make good choices later on. I think the biggest challenge for all of is how and when to disciplining our kids, especially when they’re in the stubborn toddler years. Today, we have a special guest piece from two professionals who will help us navigate those tricky water and learn what to do when toddlers misbehave, but first, let’s talk a little about WHY toddlers act up! What’s the Deal with Misbehaving Toddlers? 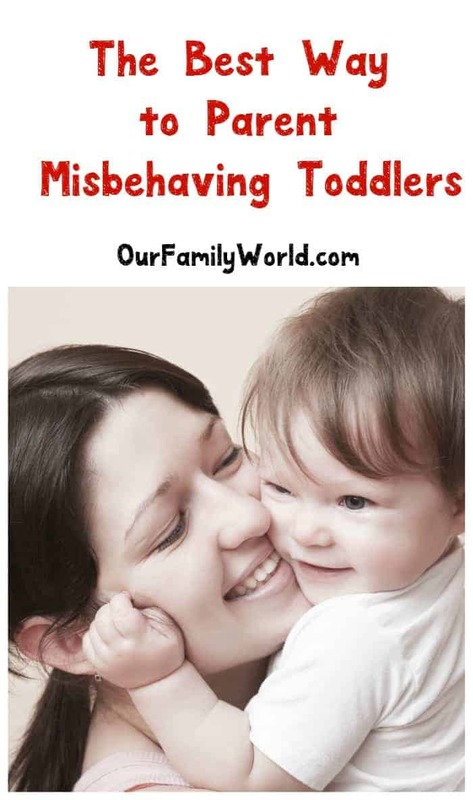 Misbehaving toddlers: we’ve all been there! Whether your tiny tot throws an epic tantrum in the privacy of your own home or in the middle of the grocery store for the whole world to see, it’s virtually impossible to escape the toddler years without some sort of outburst. The good news? Misbehaving toddlers are absolutely normal. In fact, acting out is a natural part of child development. Why? Let’s look at some of the more common reasons, then we’ll get into how to handle misbehaving toddlers. Your tot is just learning to communicate with you, so there are bound to be a few snags. As parents, we pride ourselves on being able to speak “toddler,” but let’s be honest: 50% of the time, we’re completely guessing at what our kids are trying to tell us! Tantrums can occur when signals get crossed between you and your tot. When your toddler throws his favorite teddy bear across the room and stomps his feet at nap time, he’s trying to say, “I’m not tired yet,” or maybe even “I’m too tired to sleep!” He doesn’t have the words to explain his feelings quite yet. Toddlers are naturally curious little beings who are just learning how the world works. They don’t yet understand that the world can be a dangerous place and that you’re trying to keep them safe. To them, when you pull them back from the edge of cliff (figuratively, although sometimes literally! ), you’re keeping them from seeing what’s on the other side. When you say “no,” to them you’re not only keeping them from exploring, you’re hampering their need for independence. It’s a double whammy. This is probably the most common reasons that toddlers misbehave and it kind of goes along with the other reasons. If toddlers aren’t mature enough to communicate their feelings, they’re certainly not old enough to recognize, understand, and contain those emotions. As we grow and learn, we develop kind of a filter that teaches us what (and what not) to say and do. Sure, we get fuming mad when someone cuts in front of us in line at the grocery store, but we know that stomping our feet and screaming about it isn’t exactly socially acceptable. Yes, some adults do it anyway, but they’re a whole different matter. Most of us know that we can’t pitch a hissy fit in the middle of a store just because someone did something we don’t like. Your toddler, on the other hand, is still learning that. As an adult, I get grumpy when I’m sick, and I have all my “filters” in place. Your toddler doesn’t really understand that colds, belly aches, and other illnesses are just a part of life, and that when we get them, we need to rest. All they know is their little bodies don’t feel very well and it’s making them unhappy. Now that we understand some of the reasons toddlers misbehave, let’s learn how to properly diffuse (and maybe even prevent) those tantrums! I give you Dr. Laurie Berdhal and Dr. Brian D. Johnson to share their insights. The terrible 2s and 3s is a time when we test our parenting skills and our kids test our patience. But how we respond while our little ones make required small gains in independence impacts how our children feel and act in the future. The most crucial foundations for emotional health and prosocial behaviors are close relationships with parents while growing up. These begin when infants and toddlers receive sensitive responses to their needs, positive face-to-face interactions, and nurturing touch from caretakers. But misunderstanding normal toddler behavior can lead to frustrated, confused, and angry parents and children. Here are 5 common mistakes that parents make with toddlers that can cause trouble. Expecting toddlers to do things their bodies and brains aren’t developed enough to do. Recognizing when expectations aren’t realistic and not pushing them to do things they aren’t ready for prevents future emotional and behavioral problems. Believing that emotional behavior is intentional. Toddlers normally use emotions to communicate because they’re too young to regulate their emotions and verbal skills aren’t well developed. Thus, although unpleasant, crying, screaming, and fussing are normal. In fact, something could be wrong if they don’t happen. Not understanding that toddlers misbehave on purpose as part of normal development. Even when they can control their behavior, intentional disobedience is necessary and normal in toddlerhood to begin developing into unique individuals. Expecting consistent obedience. One- and two-year-olds aren’t capable of consistently following commands and requests. Three and four-year-olds can do what caretakers ask only about half the time. *Affiliate links included below. We earn a small commission if you make a purchase. Spend much more time and energy on forming a close relationship than on getting good behavior. Be calm even when your child isn’t. When you’re angry or frustrated, respond how you’d like them to respond. When they’re frustrated, teach them to ask, “Can I have a little attention please?” and then give it to them. Young children are often naughty just because they want your attention, so providing it can prevent misbehavior. Even G-rated programming is full of aggression, so limit media exposure to age-appropriate educational shows and co-view to ensure appropriate content. Reduce stress and anger while preventing future behavior problems by simply keeping expectations for toddlers realistic. These early years will be much more fun when you aren’t wasting time trying to change normal behaviors before tots are ready to learn how. It’s good to have a plan when it comes to misbehaving especially in public. I think these are all helpful! Misbehaving is expected, what we have to work on is our reaction to their behavior. I think these are great tips! Great tips! I agree with you on all the tips you mentioned. I personally practice eye contact and be consistent when it comes to disciplining a toddler. As a mother of a 4 and 5 yr old and a newborn I sooooo agree with this tips! I do not miss the 2’s and 3’s. I didn’t handle them very well, would go back and do things differently. But the important thing here is that we all survived! Parenting is not an easy job at all & you need a lot of patience to bring the best out of them. These are some great tips that could come so much handy for every parents in taking care of their toddlers! Toddlers do show emotion and I have learned that the reason they scream or throw things is because they are frustrated with something they can’t understand or can’t do. It is showing them that you care and that you are always ready to help and be there when they need you. Thank you for this post. It is worth sharing with all those new moms out there. These are great tips. I think it’s important to help them recognize their emotions. Make sure that it’s consistent discipline!